Hello ABSers! I'm Brandi, and I'm a little obsessed with color. Heather has asked me to share the color palettes I love doing with you, and as this is right up my alley, I'm delighted to be here! This month's challenge photo is near and dear to my heart, since New York City is a second home for me; in fact, as I write this, I'm there right now! The Chrysler Building especially is a favorite of mine, because it was the first building that I learned about on my very first trip to New York ages ago. For every trip after, my brother-in-law would quiz me about the different buildings that make up the New York skyline whenever we'd be on our way back to the city from the airport. And every time, the Chrysler Building was the first I recited because the architecture is so beautiful and distinctive. If I had a favorite NYC skyscraper, it would be this one. As for the colors I see in it, of course you can't miss that amazing blue sky, right? But I also see dark charcoal grays in the windows, warm taupe-y grays on the sides of the building, and grayish-blues in the shadows and shiny metal top reflecting the sky. And, completely unexpected, a funny, random bit of yellow-orange peeking out of a window at the bottom. What colors do you see? What colors are you planning on using for your challenge piece? 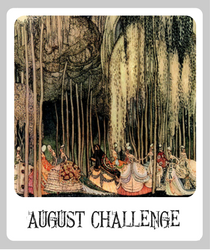 How will you interpret this month's challenge? For more about Brandi, you can visit and connect with her on her blog, Brandi Girl. Yea for color! Miss Brandi, this is going to be my favorite post each month, seeing your color interpretations. I am off to make up my monthly ABS Etsy treasury inspired by this palette and this amazing architecture! Enjoy the day! I'm so excited for this challenge. 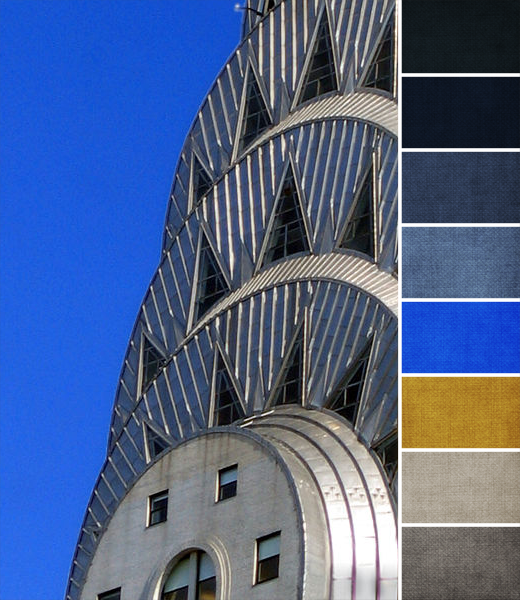 I already have a few pieces in my shop inspired by the architecture of the Chrysler building. So, I did a little extra research for this one and found photos of some eagle/chimera gargoyles on the building. I'm messing with ideas to incorporate that into my piece. I love this building too. I can see just the top of it from my apartment which is a second home for me too. Eventually it will be the only home which is why I can see this building, we bought a two bedroom so that I have my own space where I can keep my computer and bead stuffs. I love the color too. It is kind of jarring in NYC where so much black, white, and light blue is the norm. I have some loud purple fused glass that I like to wear here, it makes me feel a little different when I wear it! Go with the color, it's a great subject! I absolutely love the Chrysler Building. It's so beautiful. I have a ceramic cabochon that would be perfect for this challenge!